Magazine for the fall 2017 edition of Contact. The magazine, distributed to 60,000 friends and alumni of the College, was designed by Kari McCormick, visual communications manager, and featured alumni profiles and stories written by CRM writers and photographed by CRM staff. 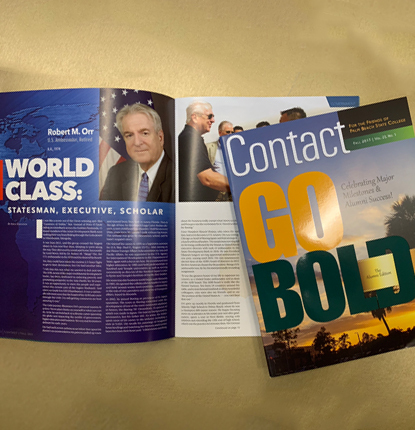 Excellence in Writing for a feature story titled “World Class: Statesman, Executive, Scholar.” The story, highlighting the career of PBSC alumnus Robert M. “Skipp” Orr, was written by Joyce Edelstein, CRM specialist. College Promotional Brand Video for “Women of the Fire Academy” highlighting the historic summer graduating class that included six female firefighters, the largest number ever. It was produced by Idalia Centeno, multimedia specialist. Promotional Brand Video for “Kenny’s Story” featuring a graduate of PBSC’s Welding Technology program, who, within one year of graduating, became a job foreman and site supervisor. It was produced by Karina Silva Santisteban, media technology coordinator. Communications Success Story or Community Relations Campaign for the news release on PBSC graduate Alexis Vazquez that was written by Tabatha McDonald, news and media relations coordinator, and pitched to media outlets. As a result, Vazquez’s story received widespread coverage. Stories appeared in the Palm Beach Post, Sun-Sentinel and Boca Raton Tribune and aired locally on WPTV News Channel 5 (NBC) and CBS12 News. The Channel 5 story also was picked up by the NBC network, running on affiliate stations in Seattle, Fort Myers, Knoxville, Orlando, Sioux City, Iowa and Charlottesville, Va. Excellence in Writing for a story about the Reef Hope Project led by Professor Jessica Miles, Ph.D. The story was written by Kristi Sorrow, CRM specialist. The awards were presented during the District II Conference held in Atlanta Sept. 30-Oct. 2. They were judged by panels of industry professionals. NCMPR is an affiliate council of the American Association of Community Colleges. Visit www.ncmpr.org to learn more. Congratulations, great job! Very proud of your work and lasting legacy to the college. Beautiful! Congratulations everyone in the CRM team.